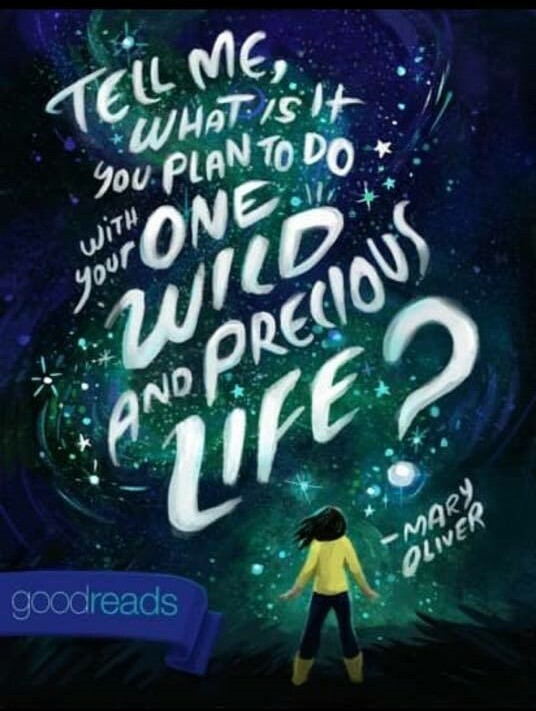 Tell me, what do you plan to do with your one wild and precious life? This compelling question posed by Mary Oliver in her poem The Summer Day moves me every time I read it, ever since I first came across it posted on the refrigerator of my dear friend Teresa. This is not a question with answers such as: earn a lot of money, lose 25 pounds, become famous or find a husband (or wife) deeply satisfies, even though these are the answers we often chase believing they are what will give us a significant and meaningful life; believing that is what will finally make us happy. In many ways answering and re-answering this questions sums up the core of my own personal life and leadership practice, and the coaching and programs I offer in the powerful inquiry practice of The Work (of Byron Katie). What thinking and beliefs keep me from living out of the centre of this question? The Work helps me to illuminate and inquire. Oliver's question is expressed as an invitation to look deeply inside ourselves; to look through and beyond the assumptions, attachments and fears that keep us stuck and small. It is an invitation into a life where we take the leap and show up in the fullness of ourselves, our gifts, our voice, our vulnerabilities, even though we can’t guarantee comfort or control, or even survival. This poem inspires me, challenges me, touches me, and at times offers me a kick in the pants (of the helpful variety) that wakes me back up to life, and out of the dream of my own thinking that can separate me from my own life, from the ability to pay true attention to what is here, now, available, possible, like the grasshopper in Mary Oliver's poem. I am so grateful to the poets who can move me this way and illuminate these human questions and patterns with such grace and precision. I often read Mary Oliver's poems in the retreats I host, because they resonate for me with how I experience my practice in The Work, helping me to tap into deeper sources of knowing, new ways of seeing, thinking and acting, and being moved into a space of new possibility. In order to really explore and create something new, we need to step out of certainty, try something different, and take some risks. If we already know exactly how it will all turn out and we can guarantee that, then chances are we are not stretching very far into new territory. With the complexity and often urgency of the challenges we are facing, with systems changing and in many ways not working, we need to be exploring and building toward something new. As leaders, wherever we are in the system, it is part of our work to innovate, and to support innovation. Our creative ideas, work and willingness to take risks, and our willingness to fail, is needed now more than ever. The depth of learning we need now comes from both success and failure. In complex systems we need to probe the system and learn, and we learn as much from what doesn't work as we do from what works. Most people are very averse to failure and as leaders in complexity, we need to build our comfort and capacity to fail and learn. As a leadership coach I see over and over again how deeply our aversion to failing runs and how limiting it can be. In a recent leadership training on failure, participants were noticing how strong their physical and emotional reactions were as we started to really look at personal failure stories, some of which were decades old. It is not enough to just say we are "okay" with failure. We give a lot of lip service to supporting failure. We refer to the value of “trial and error” and we talk about 're-framing' our failures or putting a positive spin on them. But in a culture so heavily focused on success and getting things 'right', most of us experience judgement when we fail, in addition to our own stressful responses. As a result we avoid situations where we might fail or hide our failures, which limits possibilities for the learning and innovation required to work effectively in complexity. As leaders, we are often tasked with 'solving' complex problems, while also receiving the message directly or indirectly that failing is not okay. This is not easy territory in our organizations that are highly geared toward controlling outcomes and guaranteeing success. Performance reviews, funding, approval and opportunities are all tightly tied to showing 'success' all the way up the ladder. It takes strong personal leadership and courage to truly support failure. As leaders (and as human beings in all areas of our lives) a crucial part of the change we are leading is at the level of changing the culture of certainty and success. This takes courage, support and personal practice to navigate. It is crucial to have a practice to process your own failures in a healthy way and to prepare yourself to fail in the future. What you believe about your failures will either cause you stress, shame and shut down, or it will free you up to learn and move forward. Unprocessed limiting beliefs about failure blocks learning and creative thinking, and eventually will cause us to be risk averse and unable to engage in innovation. Common patterns that flow from unquestioned (and often unconscious) limiting beliefs about failure include blaming others (or ourselves, or both), withdrawing, giving up, excessive thinking to try to 'figure it out', avoidance of similar situations, numbing, and procrastination. The chemistry of fear and/or shame impacts our brain function and can actually reduce our learning capacity, our capacity for big picture and creative thinking, and our ability to communicate effectively, all of which we need when we are wanting to innovate together, step up into something new or navigate uncertainty. “The Work” (inquiry process for personal leadership) gives us a powerful, accessible and effective way to inquire into our own thinking about failure. It also helps us to gain the benefit of our failures, and be able to genuinely learn and move forward. We can use The Work to inquire into our own thinking about failure: our past failures, our reactions to other people's failures, and our underlying concepts about what failure is and what it means to fail. What does it mean if something doesn't work out how you had hoped? What are your self-critical thoughts? What are your fears? Write them down and use the questions of The Work to inquire, gain awareness of and shift your own limiting patterns and free your thinking back up. As a leader in complexity, working for change, it is crucial to build your capacity to support others to fail, as much as you support them to succeed. Create a 'safe to fail' environment for your people, so they know they are supported to innovate. Sometimes known as 'top cover', leaders can provide a space for crucial innovative work to happen if they build trusting relationships and good communication with their teams, and clear areas for innovation, risk taking, safe to fail processes, probes and prototyping. It can also be valuable to support a process of harvesting learning from failures. When things don't turn out the way we wanted them to, there is often a pattern of blame that shows up from leaders, and within systems. Everyone runs for cover. Good work gets stopped in early stages. As leaders of innovation and change, it is crucial to work with your patterns of judgement and fear about other people failing as well as building your own personal capacity for failure. How do you react when someone reporting to you fails? Great leadership is personal. Leading failure, and failing at leading is very personal. We need to bring regular, compassionate and rigorous practice to our thinking, communication and response to failure if we are going to find our way forward together. In the Leadership Mind 10 month practice program, we have been illuminating and inquiring into some of the deeper and repeating patterns of mind that limit our ability to show up as connected, authentic leaders (and human beings) operating from our full capacity of mind, heart and spirit. Whether we are stepping into the personal leadership of our own lives or in our workplace and communities, what and how we think has a huge impact on the quality of our internal experience and on how we are able (or not able) to show up. We have noticed that the beliefs that connect most deeply to our values are a powerful and crucial place to inquire. Values are both at the core of what guides, inspires and defines us and our work, and also turn out to be very often at the core of what disconnects, confuses and stresses us out. When we believe our values are not being respected or are being threatened, our own thinking often fuels powerful emotions and reactivity, reducing our willingness and in fact our capacity to listen and learn. When we overly attach to our own values, we can miss the opportunity to think creatively and see possibility beyond our habitual view. The way our stressful mind processes values can create surprising and powerful blind spots, divisiveness, and lead us to war with ‘those people’ that don’t hold our values in our families, communities, workplaces and the world. It can also cause stressful 'war' inside ourselves. Rather than helping us to be more wise, agile and creative in these moments of difference, attaching tightly to our values makes us rigid and pulls us into existing and often polarized positions and reactions, often (ironically) violating our own values in that moment. I attach to the belief "she should respect me", and go to war demanding her respect - disrespecting her, disrespecting myself, and teaching disrespect in the process. That is not what I want (although the adrenaline rush can be temporarily attractive), and is often not visible to me in the moment. Yet I need to engage some deep practice to get out of this trap without overriding or denying my own values and value, and without defaulting to passivity, denial or superficial positivity. While it can feel great, connecting and empowering to speak our values, put them on posters and find other people who share the same version of them that we do, genuinely living from and with our values is much more challenging. Learning how to hold our values in a way that allows us to genuinely live them turns out to be much more complex than just identifying and stating them, and feeling how important they are to us. Cultivating a mindset where we can be connected to our own values and be genuinely open to engaging, learning and thinking creatively in contexts where our values are challenged requires rigorous personal practice right at the frontier of our own beliefs and reactions, whether it is in politics, our workplace, or in our homes with our own children or partners. Using The Work to engage your value beliefs can take you into the depth of the complexity of your own inner system in a way that gives access to powerful learning about yourself, others and the world. The rigorous looking and listening available through inquiry, and the mindset we can cultivate by honestly engaging our own beliefs, is the place we can transform our relationship to our deeply held value beliefs in a way that creates the possibility of fundamentally new ways of thinking, communicating and acting in the reality of being human together. The Work provides a simple, clear and accessible structure in which we can challenge our own thinking compassionately and learn from what emerges. 16 years in practice, this transformative power of The Work continues to amaze and move me as I do my own work and support others in doing theirs. Where are you finding your own values challenged in ways that take you away from living them? What are you believing when that happens? Write down your beliefs and you can apply the questions of The Work to find what is true for you beyond attachment. Click below for more information or to apply for the Leadership Mind 10 Month Intensive Coaching Program. Money can feel like a taboo topic. We get so many stressful and confusing family and cultural messages in our lives that create underlying limiting beliefs and associated behaviours that cause even more stress or keep us stuck. Often we are not even aware of the beliefs that form our hidden operating system that connects so deeply to our sense of worth, identity, safety and survival. Without being aware of our own beliefs and thinking patterns, it is impossible to make lasting change and align our financial lives with our values and conscious choices. I used to take months to do my taxes. It was a very stressful time and every day taxes were on my mind. I would think "I should be doing them", "they should be done by now", "it is too confusing", "something bad is going to happen". One day, I overheard my 8 year old daughter earnestly telling someone, “taxes are very important and very stressful for adults. When it is tax time you can’t eat dinner at the table for a long time because that is where all the papers live, and it makes the adults very sad and grumpy.” It was shocking for me to hear this from her perspective and see what a knot I had myself in and what it was costing me. It was a good wake up call, and I turned to my practice of The Work to look at the limiting beliefs and fears that were running me. It was powerful, surprising, and profoundly helpful. When I look back now I can’t even figure out what I was doing all those hours, days and weeks. A stressful mind can sure drain time and energy, and block clear thinking. As a coach working with hundreds of clients over many years, the issue of money often arises in my work with people from all walks of life - whether young or old, ‘rich’ or ‘poor’. Stress, suffering and negative patterns around having, managing, and talking about money can cause havoc in our lives and take a lot of time and energy, and limit our choices. It is good news that much of this comes from our thinking because it means you can build a better relationship with money, and yourself, in all of these areas by exploring those often buried beliefs. Our stuck patterns around money are complex. They don’t usually shift by just deciding to do things differently. There is a lot of professional advice and resources out there to teach us to manage money, and many people have noticed that the best laid plans can be quickly overridden by the power of unquestioned fears and beliefs and the behaviours that come with them. The Work gives us a way to gain more awareness of our own beliefs, and tools to engage and shift what is stuck or limiting. Free of our limiting and stressful patterns of reaction and avoidance, and more connected to our own wisdom and values, we can also make effective use of financial planners, systems for organizing our money and books that give practical advice. If you would like to explore your limiting and stressful patterns around money - join me in this 6 week engaging web-class where you will learn the powerful tool of The Work and have the opportunity to illuminate and inquire into your own money stories. It has been a full and busy fall. I have engaged in a lot of both beautiful and challenging work and learning this year. Thanks to all of you who have been part of that. And to the rest of you out there being part of good work in the world. I am just about to tuck in for a couple of weeks of rest and time with my family and with myself. My to do list is not totally done. And I am pausing anyway. I wish you some pause too. This past month in Leadership Mind (year long inquiry program), we have been inquiring into core underlying beliefs about doing things right, getting things right and being enough. We are all in various ways living 'good' and 'successful' lives and it has been humbling for us to illuminate all the places that we are also limited and suffering with underlying beliefs that we have to do things right - as parents, partners, leaders, employees, citizens... and then again finding so many places where beliefs that we are not good enough, or experienced enough, or smart enough, or successful enough, or impactful enough or... are operating under the surface. Sometimes loudly causing noticeable, painful reactions, self-sabotage, avoidance, blocking, playing small... Sometimes unnoticed yet quietly impacting our choices, undermining our courage, our voice, our ability to step fully into our lives and relationships. We have been inquiring into these beliefs together using The Work, exploring the patterns and finding the cracks and letting some light in. We have been experiencing who we are when we are not run by this impossible thinking. Impossible because it doesn't align with reality. We have noticed that it is impossible to always do it right. And that when we really lean into reality, it gets unclear what 'right' is anyway. How would we know for sure? The same happens with 'enough.' Who sets the standard? How do we really know when we are 'enough'?. We have noticed that with the belief in place, the bar can continue to move, and 'enough' never happens. We can't afford to wait until we are enough, or until we can ensure we will get everything right. And it turns out we don't need to. Imagine, if everyone waited, how life would grind to a halt. And yet we can continue to unconsciously live in the prison of this thinking. Who would you be without the thought "I am not enough?" - in whatever moment you find yourself? Notice where you are enough. Notice where it is irrelevant whether you are 'enough' or not, where life is not waiting for you to be enough, where it just flows anyway. The fear that came up for many of us in our inquiries into the 'doing it right' and 'enough' beliefs was that if we let go of this thinking we would stop learning, wouldn't be motivated to grow or be good people. What we noticed was that when we were really in the clutches of this thinking, we were at least able to grow and be our best selves. Without these beliefs we were more present, clear thinking, creative, courageous and moved to action. Interesting. Check it out for yourself. Do your own inquiry and see what you find. Wishing you peace in your imperfection this holiday time. And the joy of all of our imperfect offerings. That's where the light gets in. I could not do the work I do in the world without a deep personal practice in inquiry. There is a high level of uncertainty, discomfort and conflict that shows up when we are trying to do something new, or when we are working together in new ways across all differences. As the patterns of fight, flight, stress, and confusion show up, my practice in The Work gives me a way to engage my own thinking resulting in new patterns of reaction that enable me to learn, shift, connect and stay. When we really step into the world to do our work, we find the world is full of challenges we don’t know how to solve or fix - from global warming, to office conflict to parenting teenagers. And when we are out there engaging with the diversity of other humans (with all their gifts, difficulties, opinions and ways of being) we can often get reactive, disconnected, overwhelmed and stuck. From our fear-based thinking we create patterns of belief that project a very small world with limited possibilities, and often a very small self in facing that world. When you don’t know what to do, when things feel hard or groundless, wrong or frustrating, what beliefs do you attach to? What are your patterns of reaction? Often our minds turn to judgment, fear and blame, operating from unquestioned assumptions and strongly held opinions. We create a fixed mindset and generate stressful emotions and reactions when we most need to be open, creative and connected. The Work offers a way to engage with your own thoughts and beliefs right in the places where you get stuck. Applying The Work to your own judgments, fears, assumptions and other limiting beliefs as a practice can help you shift your own ‘stuck’ and unconscious patterns. It can give powerful insight into your own blind spots and open your mind to what else is possible to bring more peace, clarity and wise actions to challenging situations. Personal practice is a crucial component of cultivating the openness we need to fully engage our work in the world and to grow and learn on this frontier of life. Whatever your practice, you may want to try applying The Work to your own thinking. It complements many other practices, and it is an accessible and powerful way to know yourself and to step more completely into your work in the world and offer your gifts. I have inquired into many areas of thinking. Some who know me might even say I am an inquiry geek. I am so curious to learn about the stories and beliefs that unconsciously undermine our freedom, creativity, wisdom and connection to the joy of life. And I am moved by what is possible when we become more aware of our thinking and take the time to inquire. I continue to be amazed by the sneaky ways the narratives associated with money show up underneath other stressful or limiting thinking. By popular demand I have been hosting the Money Mind web-class for three years now and every time I host this class I learn something new about my money story and about myself, and I notice that I get more and more relaxed and peaceful about things to do with money. I find that I think about it less, and I seem to deal with it more effectively. Interesting. I was recently on a week long holiday with my family and days after I got home I realized that I had not stressed about money once on the trip. Even with the US dollar apparently diminishing our budget, and teenagers with lots of money requests, I forgot to worry or react. I didn’t even notice that I wasn’t reacting in my regular niggling money stress pattern. I just made choices, bought some things and not others, ate food, read my book, went to the beach and enjoyed my family. What a relief. As I continue to inquire into my own thinking and work with my coaching clients of all income levels (some have millions of dollars; others have very little) I continue to see the trap of much of the thinking that can come with the stories of money in our world. Our stress, confusion, attachment and thinking about money can be the focus of a substantial amount of our time and life energy. It can also impact our lives unconsciously through stressful and often life limiting patterns, as we seek or avoid money, spend energy and focus tracking it and looking after it, worrying what will happen if we lose it and caught up in what our money or lack of money means about who we are and what is possible in our lives. The stories we carry about money can be powerful and can override our clarity about what we actually value and enjoy and how we want to be with each other. It is hard to just un-think these storylines, because they are so grounded in our culture, our education, our values and our identity and often have fear and scarcity as an undercurrent. You might be surprised to know how many people with moderate to very high levels of financial wealth have fear movies running just under the surface: living out of a shopping cart or under a bridge, starving children, repo men coming to take everything away, or in some other terrifying financial disaster. No amount of wealth appears to protect against this kind of thinking that taps into our deepest fears of failure and threat to survival. While there are some practical considerations about money in a culture that has money as its central means of trade, this kind of fear based money thinking can create stress and reactions way out of proportion to reality for many people and can actually undermine our ability to deal with and communicate about money in a clear and healthy way. What are your money stories? Do they genuinely serve your life and values? Or are they costing you too much? It can be very interesting, and freeing to look at them and inquire using the powerful practice of The Work. In order to really explore and create something new in our lives or work, we need to step out of certainty, try something different and take some risks sometimes. Not a lot of growth happens if we only do exactly what we have always done, or only step into things we can guarantee will 'succeed.' This is true in our work in the world, for innovation process (where I sometimes bring this Work), and also in many areas of life and relationship. In recent leadership training sessions and in my web-class in The Work@work, we have been spending time noticing all the places our thinking about failure causes suffering, keeps us stuck and limits us in both our professional and personal context. The more we inquire into 'failure' the more I am stunned by how deeply it runs and how limiting it can be. In a recent session, participants were noticing strong physical reactions as we started to really look at our failure stories, some of which are decades old. Powerful stuff. And good to have a way to work with it effectively and compassionately because these stories can stay with us for a long time. They don't just go away, even if we bury them they continue to inform our choices, actions and feelings until we get them clear. We know sayings like “trial and error” is a way to learn, and many of us know about 're-framing' our failures or putting a positive spin on them. But in a culture so heavily focused on success and getting things 'right', most of us experience stressful responses to failing, carry painful stories of failure that can drag us down and can even be immobilizing. We also often find ourselves trying to avoid situations where we might fail, which can have a very limiting effect on our lives and work. It turns out the category of places we could fail can encompass just about everything. The beliefs and stories we hold about 'failure' when it happens (the meaning we add) has a powerful impact on our experience of our own failures, and also how we are able to respond when others 'fail' – whether they are our children, our partners, our team members, our employees or our leaders. Common patterns that flow from unquestioned (and often unconscious) limiting beliefs about failure include blaming others (or ourselves, or back and forth between both), withdrawing, giving up, excessive thinking to try to 'figure it out', avoidance of similar situations, numbing, procrastination, depression, addictions, fear of loss.. and many more stressful responses. When these patterns of fearful thinking and stress kick in it also effects the chemistry in our body and our brain function as we shift to the a physiological fear based response. This can reduce our learning capacity and big picture and creative thinking, which is usually just what we need when we are wanting to step up into something new. If we want to gain the benefit of our failures – and be able to genuinely process them, learn and move forward, it is helpful to use The Work to inquire into our own thinking about failure: our past failures, other people's failures, and our underlying concepts about what failure is and what it means to fail. The Work gives us a way to directly engage the thinking that gets us stuck in the stressful response to failing or anticipating failure. To open our mind back up in the face of trying something new, and to open our mind up to learning and growth (and possibly also the less visible successes) when things do go the way we wanted them to or thought that they should. How do you react? What happens when you believe that something you did was a failure? When you are afraid you will fail? Or when you believe someone else failed? You can identify your thoughts and take them through the 4 questions and turnarounds of The Work, access the learning, shift your own patters, take whatever responsibility you need to, and find freedom from this life limiting concept of both “failure” and “success”. Trial and error comes with error, and the depth of learning we need now comes from both success and failure, from building our capacity for each, and also our ability to think outside of of the limiting duality of both. Doing The Work isn't just re-framing the thought, it is a way deeply shift your thinking patterns and open your mind to new ways of thinking and being.